This image from the December 2011 cover of World of Interiors captures my heart every time I see it. 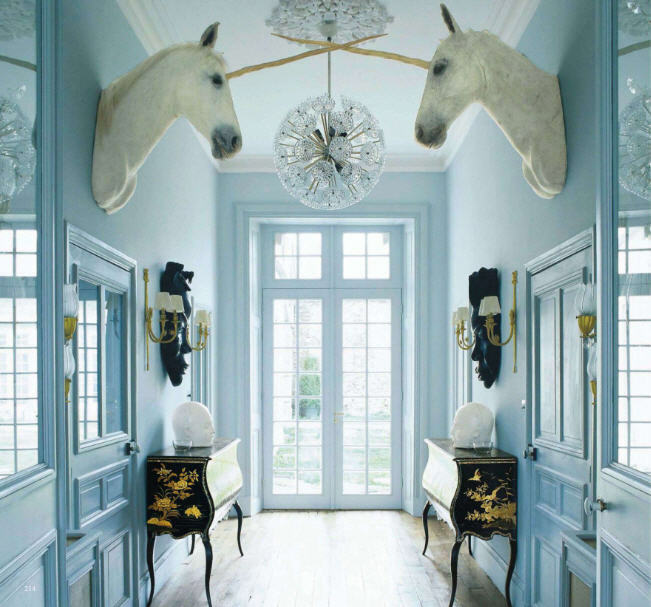 The taxidermy 'unicorns' are situated in the entry hall of the whimsical Chateau de la Goujeonnerie in France, which was renovated and decorated by the extravagant trio ( Hassan Abdullah, Michel Lasserre and Stefan Karlson) behind Les Trois Garcons in London. This gorgeous pair of unicorns perfectly captures the exaggerated yet sophisticated style the designers are known for and make for the perfect way to step into a fairytale. Dallas interior designer Louise Kemp did not forget fairytale elements when designing her home. 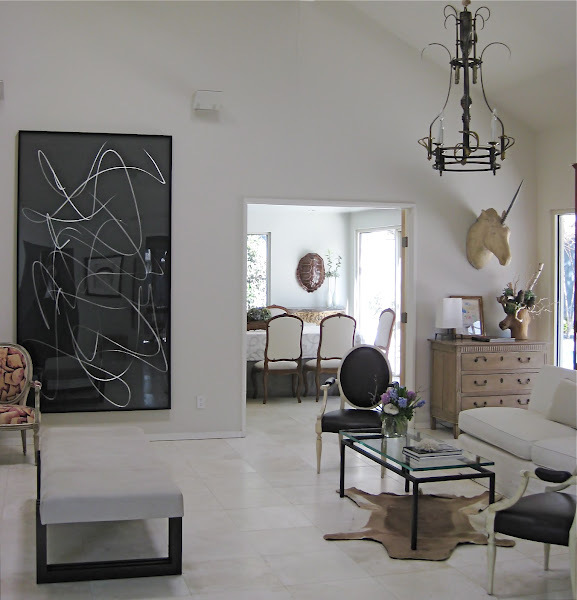 She combined a unique 19th century plaster unicorn with modern art and furnishings as well as more classical french chairs to create a stunning living area. Now it's official. I believe in Unicorns. Do you? LOOOVE Unicorns - My faves are the ones in the entry hall of the Chateau de la Goujeonnerie. The red eyed ones are totes creepy, but I can't deny I'm intrigued! I love the entry way to the Chateau de la Goujeonnerie and Louise Kemps more understated version, however the red eye ones creep me out too much, haha! Love that rustic dresser in the last picture. It reminds me of Restoration Hardware! This is so pretty, very ethereal. Love the all white rooms, gorgeous! OMG! I have never seen a room with a unicorn bust. That is just awesome!! haha! Love the first photo, the style in that room is lovely! Very intriguing addition to a home! Okay where does one find these? Because I'm in love. I'm not entirely sure how I feel about these. I'd feel like they were watching me. Great pictures! I love the last one! ok, seriously the next time I redecorate I'm using unicorn elements! 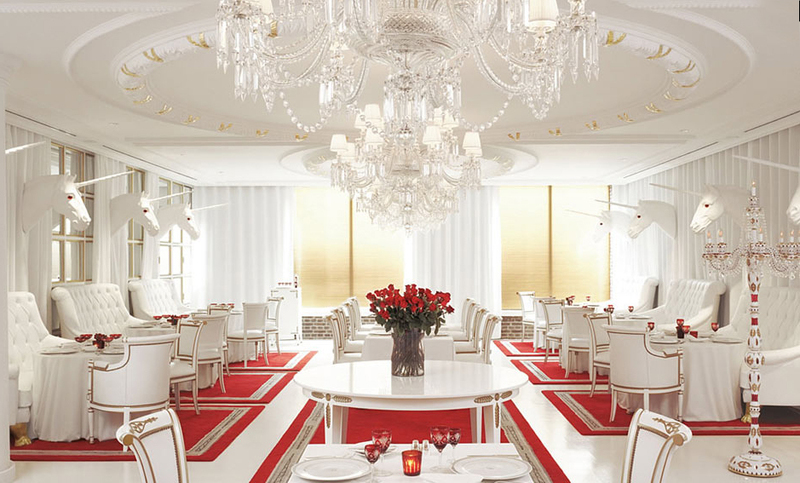 I am in love with white decor with accents of color. The fairytale elements are a bit creepy though. But the inspiration is still there. Fairy tale intior design is my favourite, I am obsessed with that whole look, and my bedroom is inspired by this kind of thing. I love your blog, I'm so glad I discovered it the other day! Can't wait to see new posts. 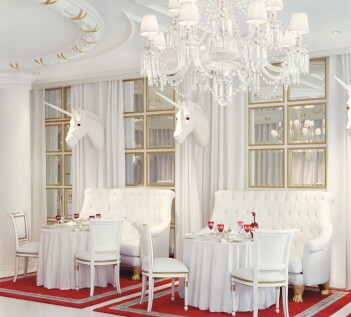 These rooms are very stylish and I like the fake unicorns but not so much the stuffed real horses . Loving the unicorns. Might creap me out at night though. ok whoa whoa whoa. taxidermied horses with unicorns stuck on? that is serious dedication to one's love of a mythical creature. it looks great with the blue walls though! Those spaces are incredible!! Yes, unicorns do exist--somewhere--I hope!!!!! Wowwwww beautiful blog!!!!!! I follow you!!! what a luxury... what an amazing post...! I thought that it would be great to have so lovely person among my followers and be your follower also~!